You'll see better, look better, and feel better with no-glare lenses that are designed to deliver a complete protection. Say goodbye to this vision issue and see the world with true colors, depth, and clarity with Xperio UV Polarized Lenses! Call us at (601) 853-1871 today. 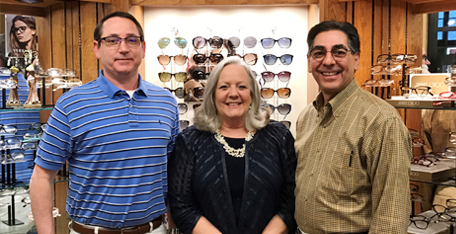 Whether you need eyeglasses or sunglasses, our shop has your eyewear needs covered. Our strong relationship with lens and frame suppliers ensure you’ll have access to trusted brand names and hi-tech lenses from the top manufacturers. "We use Anderson Optometry for all of our family’s vision needs. Recently, we had to have our youngest fitted for new glasses and he made the experience fun for her and informative for us. We know Dr. Anderson will always take good care of our family’s eye care and that’s why we wouldn’t go anywhere else." "Dr. Anderson and his staff are so patient and friendly. Dr. Anderson prescribed me glasses and I had the toughest time picking out frames. They didn’t rush but instead made helpful suggestions and now I have an awesome pair of frames, not to mention the fact that I can see ten times better than before. You guys are the best!"